For me, contact is the most important aspect of the game. It is an area which we make sure we practice at every training. In this module I will take you through ball presentation, followed by the role of the second player in securing that ball. Everything we do in the contact area is about making sure we buy a little bit of time, one or two seconds to ensure we can secure and maintain possession. Give it a go coaches. Critical aspects of the game very well presented. I just love the reference to talent and effort. So true. Expertly delivered and exactly what our players need to win those rucks. Excellent tuition material from Gatters. What’s the thinking about having the ball carrier roll once or twice after the tackle? Excellent video and great lesson at the collision phase and back into the game. Basic simple easy to coach brilliant set of drills. If all players could present the ball and clear out like this at an early age it would be second nature to them forever more. Regards, Mike W Galwegians U13’s. Have yet to find anything on this website not worth looking at. Well done and thanks to all those involved in this site. Excellent video highlighting the importance of good body positions. Whilst it appears for 16 or under 18 yr olds be make sure the squeeze ball is applicable for your age group? Great, learning for me. 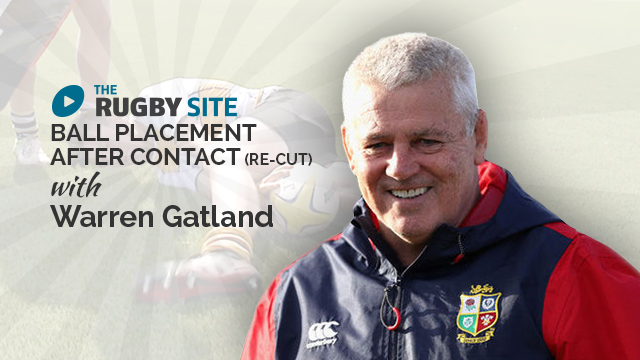 Top session Mr Gatland. This video keeps failing a third of the way in. Great session, especially for women’s rugby where the breakdown needs great attention. Can’t wait to try these skills out. I have one question, when does the player do which method for placing the all? Excellent video and updating methods which will be a good start for pre-season training. Video ran fine. a good refresher drill for body height for my juniors. muy buen video y material . Cuando estaría disponible la traducción subtitulada ??? There is no law against placing your hand on the ground when driving over a ruck as long as one arm is bound to a team mate or opponent. The law states that players must endeavour to stay on their feet. So as long as you have a continued forward motion, you are in the clear. Where you will be penalised for hands on the ground like that is if you are over the ball, not moving or attempting to make a positive play and preventing the opposition from playing it (sealing I guess). It’s jumpy for me, Paul, but it continues after a few seconds … … regarding the video, as a coach who also referees teenagers, there are a whole lot of “planes landing” in this video. Technique like that will get you penalised by most refs. I like the drills, but I’d have the tubes a bit higher so the boys aren’t going straight to ground. I’d prop them a bit higher or have it set up like the ‘Laurier Fisher runs several drills video’ on YouTube. I’d also demand the bag holders be a long stronger (even with a team mate latched on) so those cleaning out have a solid base to push against legally and safely, that is not falling on their faces. Anyone else having issues with the download after 12 mins in? Just got audio. Let me know please rugby site tech folk, was just getting into it….